Have you visited Florida's 30 A? If not, what are you waiting for? The tiny beach towns that are clustered together along this stretch of highway in Florida's panhandle are as charming as they sound. With names like Seaside, Seacrest, Watercolor, Sea Grove, Rosemary Beach, Grayton Beach, Water Sound, Santa Rosa Beach and Alys Beach, each town begs you to stop and stay awhile. Luckily, there isn't a bad choice in the bunch, so you can pick one with confidence. Just as the towns have plenty of beautiful houses and condos to rent, they also offer a variety of restaurants. But here's a little tip for you. 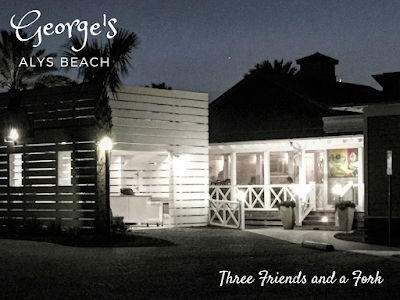 Save one of your dinner nights for George's at Alys Beach. The defining characteristic of Alys Beach is its elegant simplicity. The stark white butteries and architecture of Alys give this town a look of cool gracefulness. In this regard, George's is a perfect fit. The restaurant is housed in a tidy cottage that fits perfectly with the town's blindingly white theme and gives no hint of the colorful dishes being served up inside. Three Friends and a Fork recently had an opportunity to enjoy the cuisine at George's and it was quite a treat. The friends joining me this night were my buddies, Deborah, Dede and Nikki. 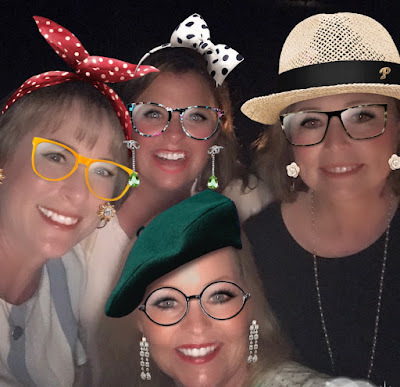 We were visiting 30 A for our annual Girls' Beach Trip. Normally our trips consist of lolling about in our beach chairs, reading, talking and lots of general laziness. We don't interrupt this inertia with eating out every night, but we do try to rouse our slothful selves at least once or twice over the course of several days, just to make sure our legs still work. That, and we get hungry for something other than chicken salad and pimento cheese, our beach staples. We chose George's for one reason. The menu was divided into two choices, Behavin' and Misbehavin'. Who can resist a menu that straight up offers you a chance to misbehave with no apologies! Heads up! Even though misbehavin' is encouraged at George's, there are no mixed drinks. Libations include beer and wine only. With that temptation out of the way, we decided to begin with a devilish appetizer of crispy calamari fries served with a horseradish remoulade sauce. They were a perfect way to start misbehavin'! Then it was on to the entrees. I chose a dish of spicy salt and pepper shrimp tossed with melon, sugarsnap peas and fried brussel sprouts in a tangy Thai vinaigrette. Served with basmati rice, the dish had a definite Asian flavor. Nikki had, what she described as, THE BEST oysters she had ever eaten. After listening to her rave about those delectable oysters, I regretted I had not gotten them as well. Not that my shrimp weren't delicious, just that Nikki and I share a profound love of oysters and these were apparently in a class by themselves. Deborah selected one of the night's specials, which was cobia topped with fresh micro greens sitting on a bed of cheese grits. She enjoyed her dish, too. It was so pretty! Dede, after much debate, decided on grilled red snapper. Ever the landlocked Kansas girl, she wanted to make sure she didn't order fish that came with the eyes staring back at her. Her headless filet of snapper was perched on a bed of fruity salsa with a drizzle of balsamic reduction. It looked absolutely delicious. We decided if we were going to be bad, dessert was a must. Instead of sharing one dessert, we decided to be completely reprehensible and order two, plus one to go! Our first bad choice was something called Warm Chocolate Toffee Goo. Seriously, who in their right mind could resist that? A gooey toffee brownie was topped with wonderful homemade vanilla ice cream, warm chocolate goo and chocolate candy straws. If you are going to be bad, you might as well be real bad. Right? This one was the favorite of everyone but me, I think. Not that I didn't love it! On our server's recommendation, we also got a goat cheese panne cotta with fresh berries, tres leches pound cake croutons and apricot ginger curd. This cool dessert was almost angelic compared to the chocolate goo and I absolutely loved it! This is my kind of dessert, creamy, not too sweet and topped with fresh fruit. Our least favorite of the three desserts was the Hummingbird cake we took back to our room. I think maybe it would have been better if we had eaten it at the restaurant, but after being refrigerated, it became very dense, more like a heavy banana bread than a cake. If you order the hummingbird cake, eat it right away instead of carrying it home to eat later. George's at Alys Beach is the perfect place to go when you feel like misbehavin', or even if you decide to behave. We don't know any of the behavin' kind of people, but you might. As for us, we can't wait to go back and misbehave some more! Three Friends and a Fork and Dede, Deborah and Nikki are happy to give George's 3 Very Misbehavin' Yums UP!